Taiko Jam is the keynote concert of the North American Taiko Conference and is also meant to showcase a selection of the finest taiko groups in North America. Over the next few weeks, we will be introducing each of these performers. This week, we’re kicking things off with NEN DAIKO from Ekoji Buddhist Temple in Fairfax Station, VA.
Nen Daiko is the taiko ensemble of Ekoji Buddhist Temple in Fairfax Station, VA. Nen Daiko was founded in the fall of 1994, started by temple member Beth Fujishige’s wish to create a multi-generational activity that could bring together the whole temple community. 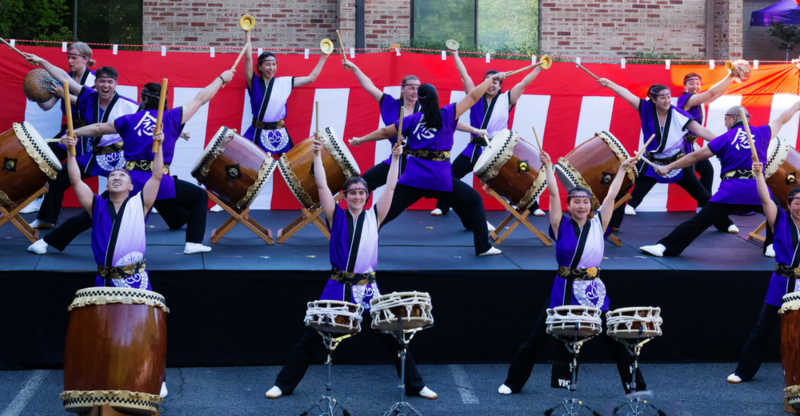 Since then, Nen Daiko has evolved into a performance group, entertaining audiences throughout the Washington, DC metropolitan area with pieces that include traditional festival songs and more contemporary compositions. Our members are from diverse backgrounds and faiths, joined by our common respect for the art of taiko, the teachings of Buddhist taiko, and our joy and exuberance for the artistic expression of taiko. The group owes much gratitude to Ekoji’s founding minister Rev. Kenryu Tsuji who provided the name “Nen,” our sister groups Soh Daiko (NY) and Hoh Daiko (NJ) for their generous mentorship, and all the causes and conditions that have allowed us to practice and share the art of taiko for the past 23 years. Since its inception, Nen Daiko has performed at many local and national events in the DC area, such as the Kennedy Center for the Performing Arts, the National Theatre, the National Mall, the Jefferson Memorial and Tidal Basin, the Smithsonian American Art Museum, the NEA/NEH Presidential Commission on the Arts, the National Japanese American Memorial to Patriotism in World War II, the National Cherry Blossom Festival, and the summer Obon Festivals at Ekoji Buddhist Temple and Seabrook Buddhist Temple. Nen Daiko will be performing in Taiko Jam for the first time. Register for NATC today and remember to add on a ticket to Taiko Jam 2017! Right now, tickets are available to conference attendees, and we will be opening ticket sales to the public in April!